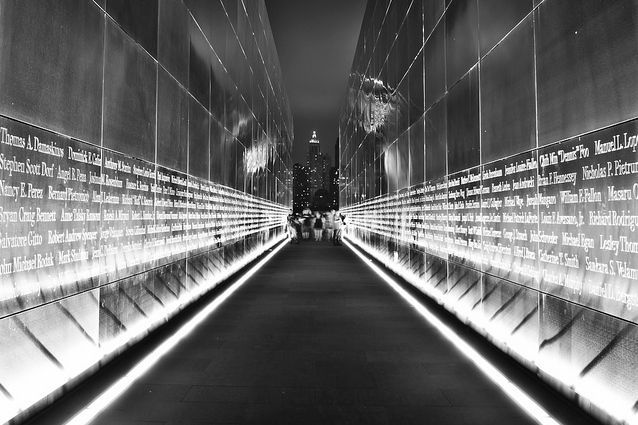 Though I haven’t yet visited the 9/11 Memorial down at the World Trade Center, it has been so thoroughly documented that I am not only aware of its existence, but also have a reasonably good idea of what to expect when I do finally go in person. 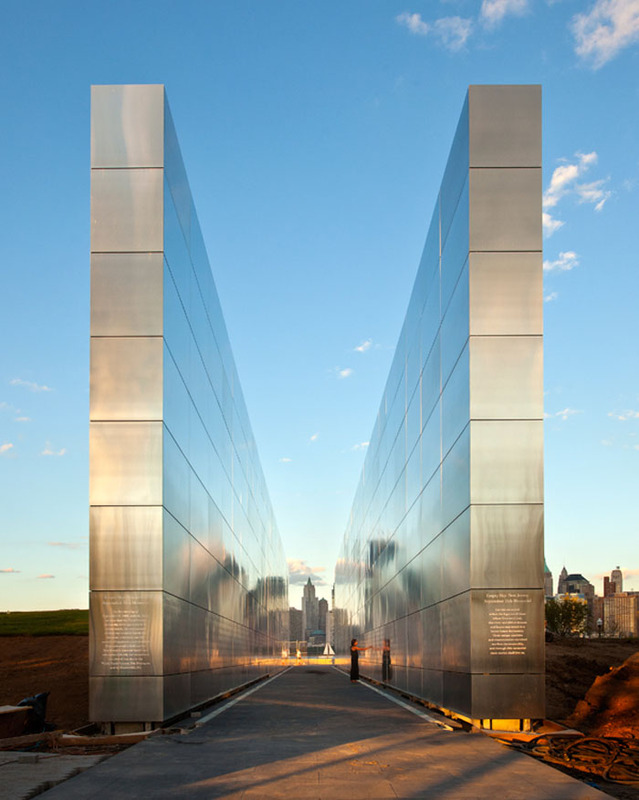 The same cannot be said of the New Jersey memorial, Empty Sky, on the other side of the Hudson River, honoring the 744 victims from New Jersey who lost their lives at the Twin Towers on September 11th, 2001. That is until now, that I’ve come across its existence. 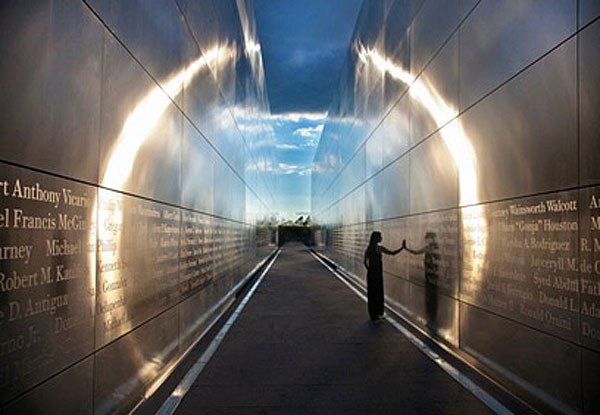 This simple yet striking memorial, designed by Frederic Schwartz Architects, consists of twin cement and stainless steel walls, 12 feet apart, 30 feet high and 210 feet long, that reflect the changing light of day creating a halo effect at dusk and dawn as the sun hits the parallel walls. The corridor created by these two walls dramatically draws the eye to the vacant (empty) space where the towers once stood. Working with graphic designer Alexander Isley, it was decided to engrave the names of the victims in ITC Bodoni 12 in a larger size than is usual in memorials, using a cap height of 3.6 inches, spacing the names out so that none of them are broken, and allowing for the families of the victims to easily create rubbings of their names, if they so choose. Other consultants on the project include Ove Arup & Partners Structural Engineers and Arnold Associates as the landscape architects. The project was unveiled this past September. I’ll have to pay a visit to this memorial in addition to the inverted fountains downtown. This entry was posted in Architecture, NYC, Stuff We Like, Typography. Bookmark the permalink. This is a seriously poor design for the beautiful waterfront there. A berm was created, then 2 ostentatious slabs placed directly on said berm which is at the end of a beautiful open park with the most stunning skyline views in the world… or was until this monster was birthed. That waterfront should invoke joy and freedom and openness, not tragedy and sadness. The world needs monuments, but not in your face and certainly not ruining successful land development. This was pushed through so hard by politicians as something to latch onto for political cred in the face of overwhelming negative response. There is a time and place for inspiring and thoughtful monuments- this is a perfect example of missing both by a literal mile. cold. hard. colorless. massive. obtrusive. neither cathartic or at the very least, even interesting. Just a cold dead reminder of a tragedy that should be reflective and perhaps inspiring if done correctly. This makes me feel embarrassed. I used to like that park too. ugly. Those of us who use the park hope it falls into the river.